Those who regularly read my blog know that I am a big fan of Rupaul’s Drag Race. From time to time, I insert drag queen references in my posts like this, this and especially this. Although my fandom with these gorgeous queens subsided last year, my love and respect for the craft is still there. There are a few queens who holds a special place in my heart and one of them is the controversial Willam Belli. I even bought his CD and wrote an album review about it in my not-so-updated personal blog. While I was working on a travel-related blog post sometime in November, a fellow drag race fan posted a link indicating that Willam Belli is flying to Singapore on January 31 for a show. Meh. Too good to be true! I panicked and looked for the website of In The Dark Asia (show producer) right away. I was literally shaking and I’m not so sure whether it is due to the fact that I drank too much coffee, or maybe I’m just thrilled with the fact that Willam Belli is coming to Southeast Asia. WILLAM BELLI IS COMING TO SOUTHEAST ASIA! So what will a fan girl do? I bought the tickets right then and there then I realized afterwards that I don’t have a Singapore trip planned, meaning I have to buy a plane ticket. Mama RuPaul, please give me a sign. A week after, Cebu Pacific Air had a seat sale so I bought tickets right away. WOOT WOOT! I’m going to a drag show! Finally! Then January 31 came. I asked a fellow travel blogger whom I’ve known virtually since 2009 named George. Good to know that he is also a fan of the show. He agreed to come with me. 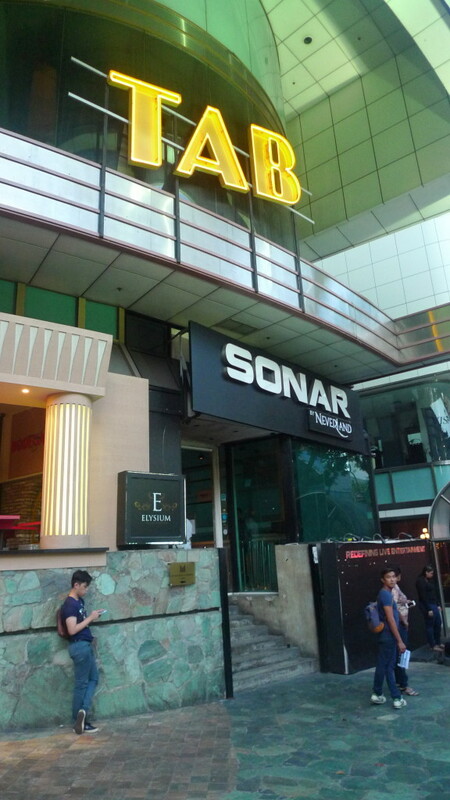 By 7PM, I am already outside TAB Singapore in Orchard Road. I was a bit surprised (in a positive way) upon learning that the show was sold out! It means the producers successfully found their target market – and that includes a Filipina fag hag who happens to blog about the event right now. The front tables were already occupied by good looking males of different races. Some brought their female friends with them and it was fun watching them get excited for Willam Belli’s appearance onstage. That time, George hasn’t arrived yet. People watching at its finest. The show started at 8PM with a stand up comedy skit by Becca D’Bus and lipsync presentations of Fanservia LeRonx and Mona Kee Kee serving Jujubee realness! Asian drag queens are fierce, hunty! Then THE WILLAM BELLI appeared in her cute dress singing her own version of will.i.am and Britney Spears’ ‘Scream and Shout’ (Scream and Sh*t). The crowd went mental and I was just smiling the whole time. I can’t believe it! As expected, Willam Belli gave a good stand up skit including that thing about chewing gums (which is banned in Singapore) and cross dressers. Of course, occasional green jokes were blurted out too. Willam Belli sang some of her songs, but the highlight is ‘Boy Is a Bottom’ with Detox and Vicky Vox singing their pre-recorded parts. Honestly, I was expecting for more songs from Willam. I was hoping she’d sing Trouble, Potential New Boyfriend and her latest single Es Una Pasiva. It would’ve been fun to see her sing that live with matching spinning moves while hitting that tambourine. The song also samples La Isla Bonita and Macarena so it would’ve been great to see what she’d do with that, knowing how crazy she can be sometimes. 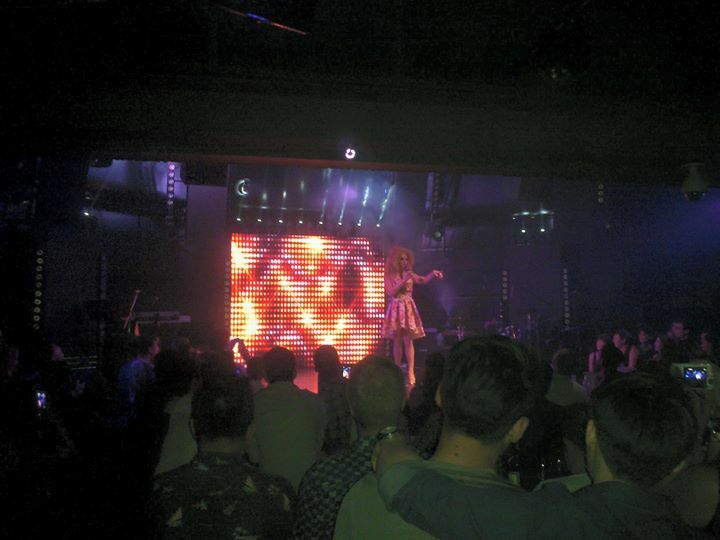 Although there were technical glitches and the ‘bitin’ factor in Willam Belli’s set, I can say that it was a good start for In The Dark Asia. There’s a first time for everything and I hope that this specific show will be a learning experience for the group. I will still support their shows and I’m happy that they addressed i on their official Facebook page. I’m expecting a lot from their first Manila show on February 25 featuring Adore Delano (yep, I’m going!). Now let’s proceed to the Meet and Greet part, which was a total fangirling moment for me. I’m sure George wanted to laugh at me, but still remained supportive when we were on queue for the Meet and Greet portion. “Don’t be! She seems nice!” George said. 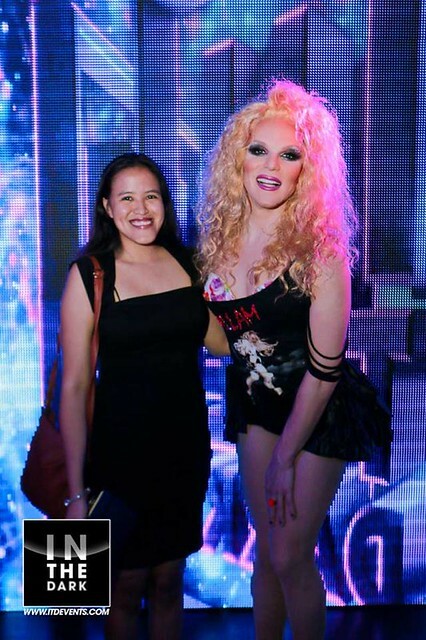 I looked towards Willam Belli and I can really see how nice and accommodating she is with the fans. I can do this! So finally my 30 seconds of fame with Willam Belli arrived. We took the ‘professional photo’ first then I asked her to sign the CD. I didn’t bring permanent marker with me because I thought she’d be carrying one since it’s a Meet and Greet thing lol but I have a black pen! As she signed my CD, I told her that I emailed her a few days back and that I’m not sure if it was really her replying to me. “That was me!” she said. Woot woot! How cool can this queen be? She also told me that she’s supposed to go to Manila too, but she had prior commitments and had to go somewhere. I checked her Facebook a few days after and girl, she’s performing somewhere in America or Australia. I’m not so sure anymore. She’s too busy! And because I had to leave the stage right away and I was in a state of fangirling, I forgot to take a selfie. I asked one of the cute staff if I can go back to the stage for a selfie. He said in a nice way that the professional photo is the only official photo allowed for the show. Huhubels. Why did I panic? Thank God the staff (or was that the Tab Singapore bar owner?) was cute teehee. Anyway, Willam Belli was still busy entertaining his fans. Some hugged her and one even gave her a nice caricature. I’m so sure she’s surprised to know that a fanbase in Singapore (and two from the Philippines!) were there that night to watch her. She looked at me and gave a signal. George and I were thinking of going to the afterparty, but its out of the way. “I need a selfie with Willam!” I told George. By the time Willam left the stage, I was already waiting outside the backstage with hopes that she will grant my request. And she did even if she’s busy talking to someone on the phone. 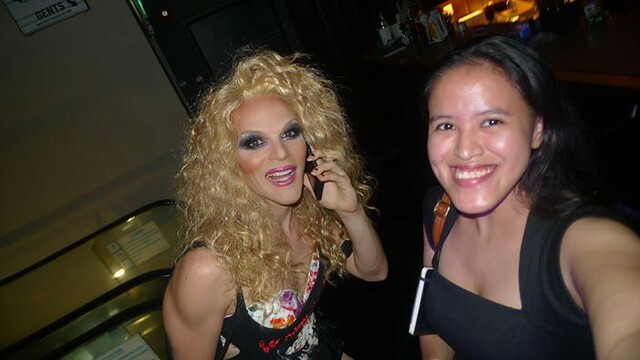 “Willam, can I take a selfie with you, please? Please!” I begged without kneeling down. “Thank you too! Ba-bye!” she waved goodbye as she ascends on the escalator with the show producers. Damn, those legs! Now I’m satisfied with my first drag queen show! Sometimes, it pays to be persistent especially if you really want something – like a selfie with your favorite drag superstar. Fanservia LeRonx made sure George and I had a blast on our first drag show! Outside, I saw the Asian queens promoting their upcoming Valentine show called ‘RIOT!’. Remember when I mentioned Mona Kee Kee earlier? 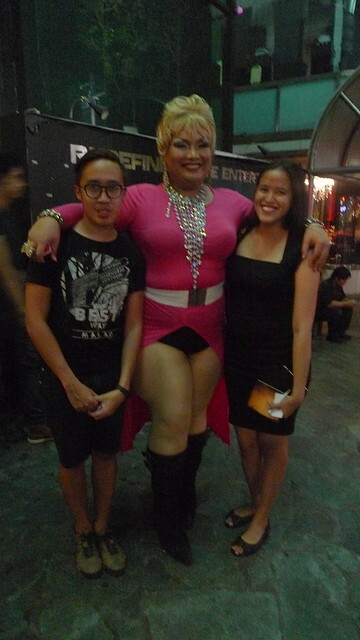 She’s a Pinay drag queen! 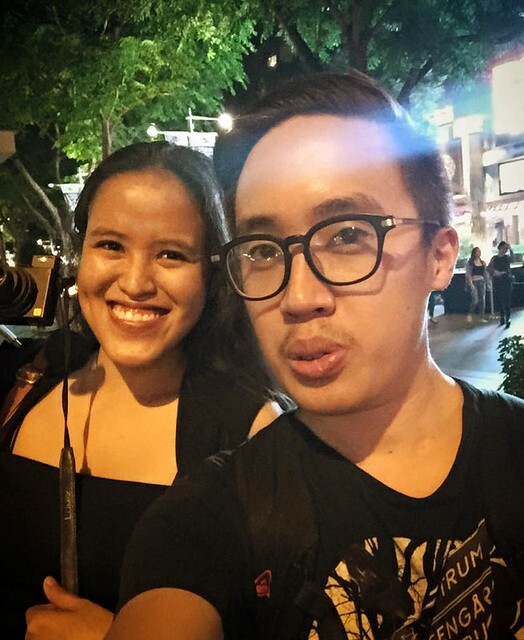 When George told her that I flew to Singapore just to watch Willam Belli, she was surprised. She said something in Filipino pertaining to if I’m a legit woman or what. 😛 I think she’s amazed with the fact that there’s an existing fanbase for drag queens in the Philippines which is not exclusive for gay men, but also real women – like me. 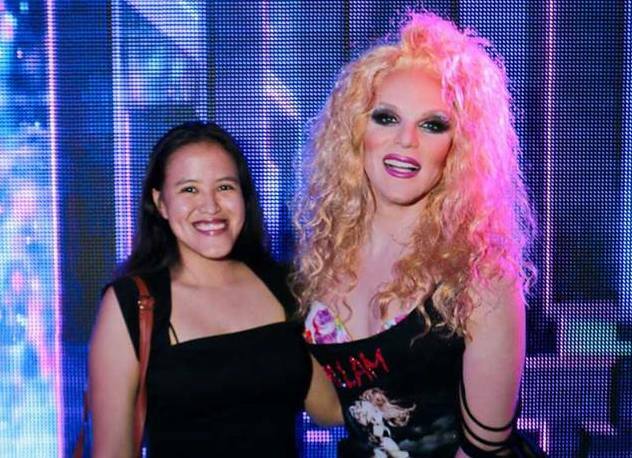 With Willam Belli – what a goddess! Have you ever flown to a different country just to see your favorite singer or celebrity in person? I think I found my new blog niche – Gaycation! Thanks dear! I was smiling the whole night hehe dream come true! I’ll be in Adore’s show too! Let’s meet and party! Ang ganda ng isinulat mo. Kailangan kitang makita ulit! Wow, that is dedication and a hilarious story! I once drove 8 hours to see Kelly Clarkson, but it wasn’t nearly as fun as the time you had. I have to admit my knowledge of drag queens was mostly limited to Rupual before this post, but it has now quadrupled and I am intrigued to learn more now. Safe travels! How fun! Willam is such a talented person.